(CNSNews.com) - The debt of the federal government increased by $8,314,529,850,339.07 in President Barack Obama’s first seven years in office, according to official data published by the U.S. Treasury. That equals $70,612.91 in net federal borrowing for each of the 117,480,000 households that the Census Bureau estimates were in the United States as of September. During President George W. Bush’s eight years in office, the federal debt increased by $4,899,100,310,608.44, according to the Treasury. That equaled $44,104.65 in net federal borrowing for each of the 111,079,000 households that, according to the Census Bureau, were in the country as of Jan. 20, 2009, the day that Bush left office and Obama assumed it. In the fifteen years from the beginning of Bush’s first term to the end of Obama’s seventh year in office, the federal debt increased $13,213,630,160,947.51. That $13,213,630,160,947.51 increase in the debt during the Bush-Obama years equals $112,219.57 for each of the 117,748,000 households that were in the country as of September. When Bush took office on Jan. 20, 2001, the federal debt was 5,727,776,738,304.64. When Obama took office eight years later, on Jan. 20, 2009, the federal debt was 10,626,877,048,913.08. 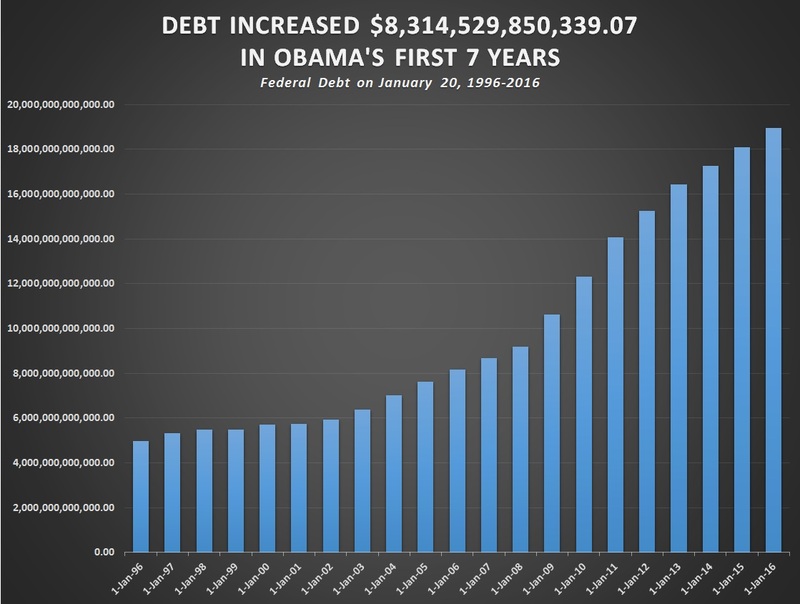 As of Jan. 20, 2016, when Obama completed his seventh year in office, the federal debt was $18,941,406,899,252.15.